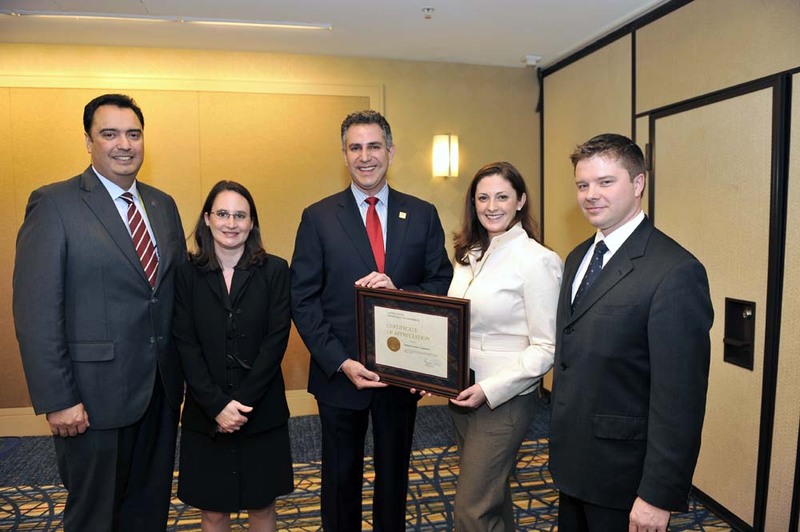 Under Secretary for International Trade Francisco Sánchez (center) presents MDCP award at the Americas Competitiveness Forum in Atlanta on November 14. Like all MDCPs, this will result in a close working partnership between the cooperator, in this case the National Chamber Foundation, and the International Trade Administration (ITA). On average, for every dollar that ITA invests in MDCP awards generates $125 in exports; awards are granted only to non-profit groups. As an industry expert on the staff of the Office and Energy and Environmental Industries, my role will be to coordinate ITA and U.S. government resources and to liaise with the cooperator. Yesterday during an intimate meet-and-greet for U.S. ACF attendees, Under Secretary Sánchez and Assistant Secretary Camuñez congratulated the Chamber Foundation and pledged ITA support for the exciting array of activities being planned – including trade missions, business forums, webinars, and Brazilian buying missions to green tech trade shows in the United States. Steven Bipes, Executive Director, Brazil-U.S. Business Council, and Kathleen McInerney, Manager, Trade Roots were both on hand to receive the award and talk about the goals of the partnership. It all starts with a survey of U.S. green tech companies. The results of the survey will provide a foundation on which to build the MDCP, and also help the cooperator keep companies apprised of upcoming events and opportunities. If you are a green tech small or medium-sized company interested in entering or expanding your overseas activities especially in Brazil, please take the survey. Non-profit organizations interested in hearing more about how they can apply to become an MDCP partner can attend “Partnering to Double Exports” on December 1.